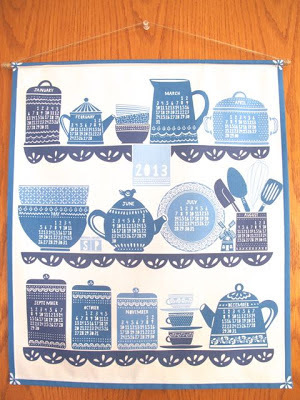 Because the first day of March is the appropriate time to talk about a 2013 calendar. 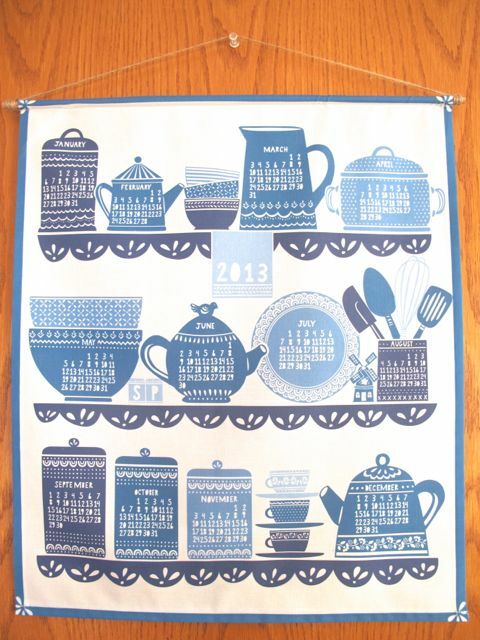 I am in love with tea towel calendars. I don't collect vintage ones, but I do have my own personal collection and it grows every year. And every year my husband questions why, but then I catch him standing in front of the hanging calendar checking dates at least once a week. It's because they are beautiful and damn handy. All the days of the year in one place. A bit of artwork on an otherwise odd wall of panelling backed cupboards. This year I got my calendar from Jumping Birds. In past years I bought from Michelle Engel Benscko, but with Cloud 9 a booming success she wasn't producing calendars this year. Yay for her, sad (just a teeny bit) for me. But I'm thrilled with this year's version on my cupboard wall. And counting down the days until next year. Lovely, Cheryl and so very handy as you have proven year after year in your own home. 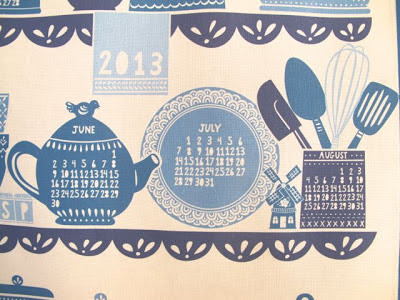 My mom had a yearly linen calendar the entire time I lived at home; probably one hanging in her kitchen right now. 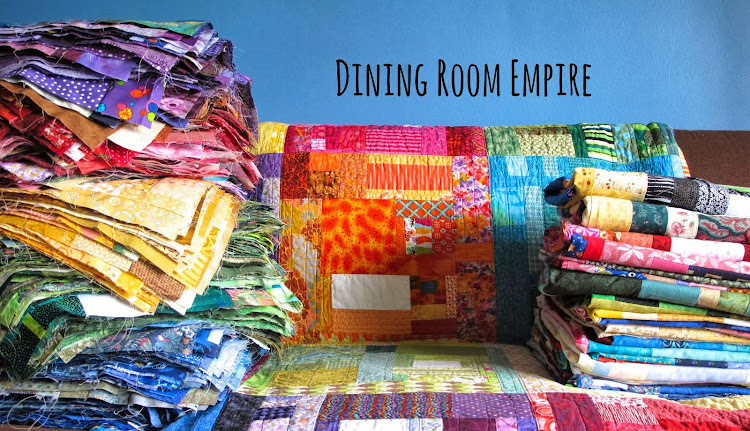 Also an easy and fun way to collect linen fabric which is imminently recyclable. Cheryl, am i set to no-reply in your comments? I can be reached at Lynda at LMI dot net Thanks, I am not receiving any responses to comments I make lately and cannot figure out what I have done to cause this to happen. 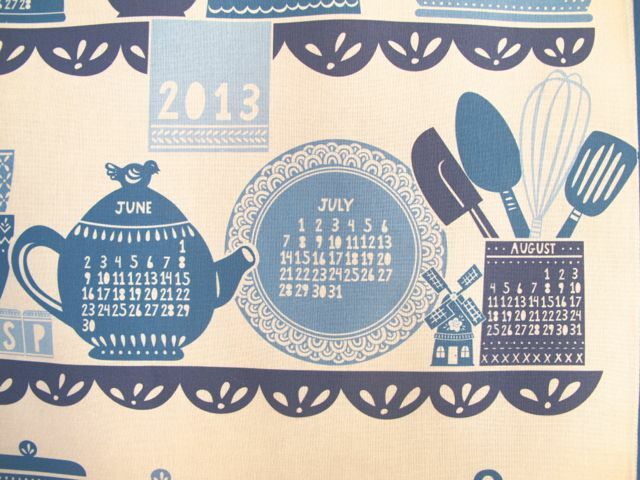 this blue and white reminds me of my mom's german blue/white dinnerware. 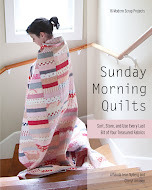 looks like you should be joining us in making tea towels into medallion quilts over at 15minutesplay.com. check it out! Wow, Cheryl! 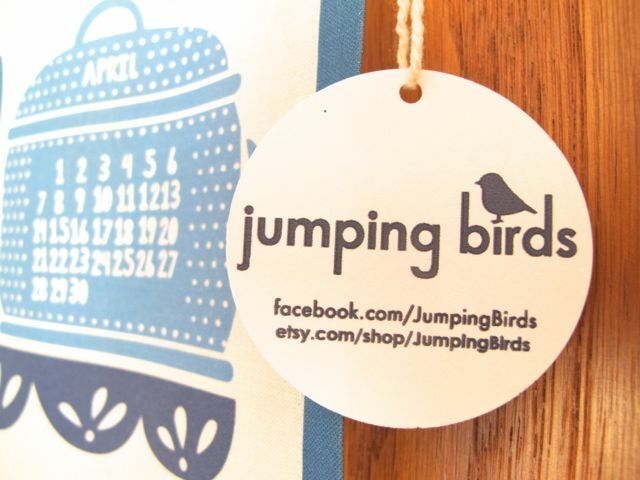 Thank you sooo much for even mentioning my little Etsy shop Jumping Birds!!! You put a gigantic smile on my face (sure to last for days!) Thanks!!! I must also mention that I skillfully and lovingly did the cutting, sewing and assembling of the calendar but the design was originally dreamed up by Stacy Iest Hsu and all of you crafty folks can get it here. On the other hand, anybody wants me to make them one, just contact me through my Etsy shop! 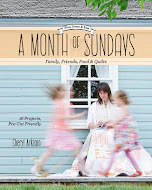 Thank you again Cheryl, looking forward to your book in the Summer! 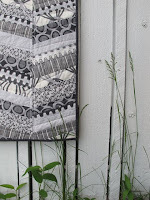 I bought three lovely patterns off of spoon flower this year. I sewed them up as Christmas gifts for myself, mom, and sister.